The charity Guide Dogs is relaunching their fundraising group in Henley. To celebrate the relaunch, two ‘Meet and Greet’ sessions will be taking place on 2 & 3 May at The Argyll Pub and Cafe Copia. The charity is also on the lookout for members of the community to volunteer and help change the lives of people with sight loss. Every hour, another person in the UK starts to lose their sight. When someone loses their sight, Guide Dogs is there to make sure they don’t lose their freedom as well. The charity could not change lives without the continued support of amazing fundraising volunteers. Rachael Elliott worked as a Research Manager in Kingsclere, led the Newbury Symphony Orchestra and raced her bike to a national level. This life came crashing to an end in February 2018 when Rachael suffered a brain haemorrhage which left her with a rare condition called Parinaud’s Syndrome. This means Rachael’s eyes became locked downwards and she cannot track left to right or perceive movement. Rachael was initially devastated: she could no longer ride her bicycle or lead the orchestra as reading music was not possible. Everyday tasks became difficult. After only a few weeks of leaving hospital, Rachael received a call from Dee, a Mobility Instructor at Guide Dogs for the Blind. Dee arranged to visit Rachael and talked to her about the work the charity could do to help her become more independent. To Rachael’s delight, Dee told her that she was the “perfect” candidate for a guide dog. This came as both a surprise and a relief: Rachael assumed that only totally blind people would be eligible to become a Guide Dog Owner, but also huge relief that she would be able to get back some of the freedom she had before her stroke. After several months of mobility training, Racheal is now on the waiting list for a guide dog. Clive Wood – Engagement Officer for Guide Dogs said “We have a range of volunteering roles within Henley’s fundraising group and you can give as much or as little time as you can spare. Any time someone can give will be helping Guide Dogs support people who live with sight loss to regain their independence and reduce isolation. At the same time, it’s a great way of getting to know other people in your community”. Why not find out more about how you can get involved with the Henley fundraising group. Your support could make a real difference. 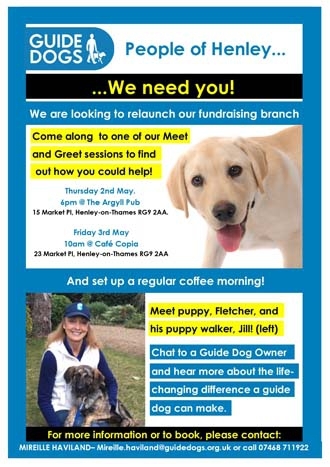 Come along to the Guide Dogs ‘Meet and Greet’ events being held at The Argyll pub in Market Place, Henley on Thursday 2nd May from 6pm or Café Copia, 23 Market Place, Henley on Friday 3rd May from 10am. You can meet some of our amazing dogs and local volunteers.